North East Victoria. Tobacco is a high value row crop and it can grow in a wide range of climates and geographic areas given the right soil type, water quality, and warm growing conditions. Very specific conditions are needed however to grow the high quality tobacco which is required by manufacturers. The soil type, mild climate with hot summers and access to water make production of high quality tobacco possible in these areas. Average annual rainfall and evaporation at Myrtleford, which is in the centre of the Victorian growing area is 1051mm and 1059mm respectively. The annual average minimum and maximum temperatures are 7°C and 21°C. Tobacco seed is very small with 10-14,000 seeds per gram. Growers produce their own seedlings which are later transplanted to the paddock. Increasingly seedling production is switching away from outdoor seedbeds to a greenhouse based system. These two seedling production systems are briefly outlined. Seedbeds are typically 20 m squared in area and are raised 10cm above the ground. Preparation of these beds is a detailed operation whereby the soil is cultivated, then covered by air-tight plastic, and fumigated to control pests, diseases and weeds. Seed is sown in each bed in mid to late August. To ensure even distribution, the seed is mixed with water and applied to the seedbed in the form of a coarse spray. Seedbeds are covered with an insulating material to increase the temperature, improving germination and growth, as well as protecting seedlings from frost and rain. Before transplanting some growers root prune their plants by forking or undercutting them. This makes them easier to pull out prior to planting and encourages the growth of lateral roots. These lateral roots help the plant to recover after transplanting. Greenhouse production using the "float" system is a relatively new system of growing transplants. 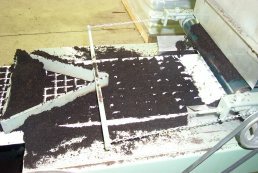 Polystyrene trays are filled with potting mix, seeded and floated on a pool of water. The seed used in greenhouses is covered with a clay coating to increase its size and to make it easier to handle. Nutrients which are essential for plant growth are added to the water after the seeds germinate. Float systems are usually sown during the first 2 weeks of September. Plants take 2-3 weeks to germinate. When they start to grow they are clipped with a lawn mower to prevent small plants from being shaded. This ensures that plants are a uniform size and makes planting easier, as well as allowing the plants to become more hardy before being planted out. Outdoor seedbeds are also clipped, but not as often as greenhouse plants. 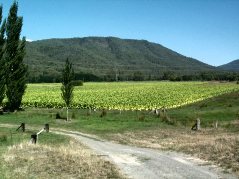 There are a number of tobacco varieties which are grown in Victoria. The major differences between varieties is their growth rate and habit, fertiliser requirement, time of ripening and resistance to disease.